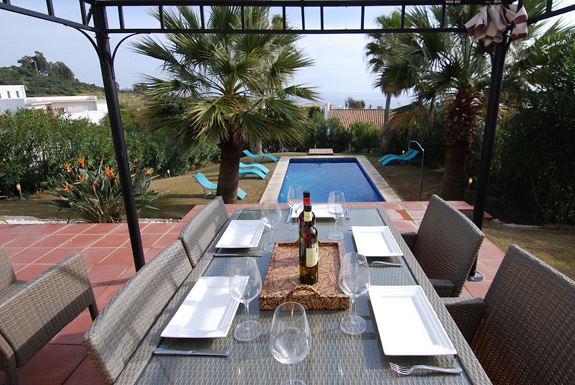 Casa Monaco is a stunning Nuevo Andalucian style Villa with views of the Mediterranean Sea. 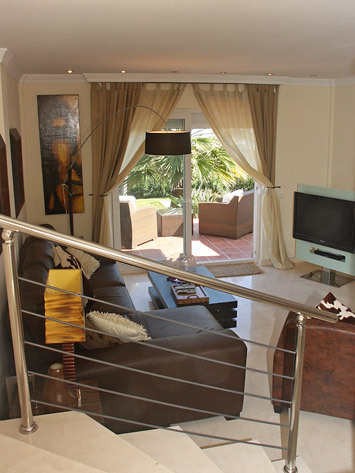 This villa has been decorated to a very high standard and there are many terraces on which to relax and enjoy the view. Arena beach is only a 10 minute walk (via a foot bridge) and Swings & La Menorah restaurants are within walking distance. 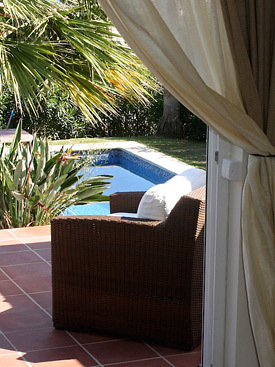 Estepona Town is only a few minutes drive away with many shops, bars and charming restaurants. In the narrow cobbled streets of the old town are a number of small Plazas or squares (next to Calle Real) in which to enjoy a coffee or a large glass of Rioja. La Rada beach in the centre of Estepona has a lovely promenade perfect for a stroll, and the golden sand is peppered with lots of Chirringito's (beach bars) to choose from. 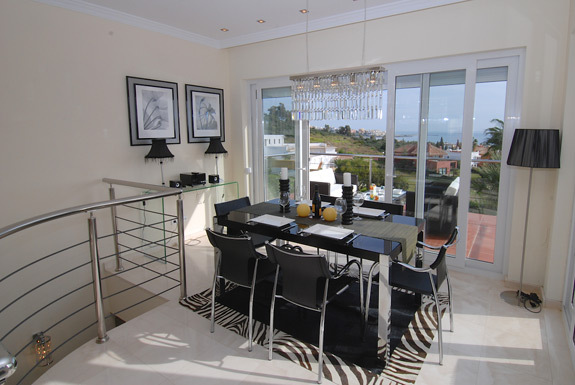 If you’re looking for something special in Estepona you will be delighted with Casa Monaco. These rates apply to a maximum of seven guests + an infant in a cot/crib (hire of cot/crib is extra) and includes: pool maintenance, gardener & all linen/towels (including pool towels). For bookings up to 10 nights the maid service will be on your day of arrival and day of departure only. Bookings for 11 nights or more will also have a mid stay linen/towel change and clean. We don't take a damage deposit, but in addition to the above rates there is a mandatory accidental damage waiver (ADW) fee of £10.00 per person, per booking. This is to cover you for any accidental damage that may occur in your property during your holiday, this will cover you up to the value of £150.00 per person. A 25% deposit is required at time of booking with the balance payable 10 weeks before occupation. 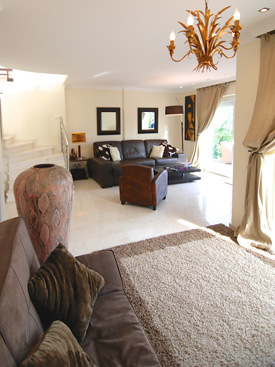 As you enter Casa Monaco you will notice the way the light pours in through the full length windows. The indoor dining room opens directly onto the front terrace. 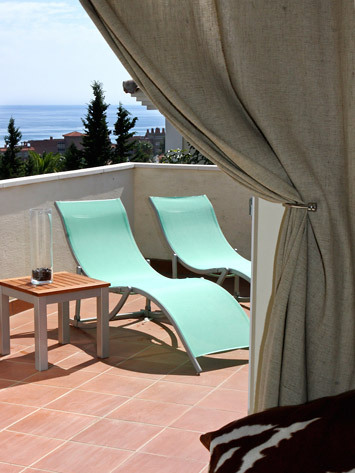 Here you will fine an outdoor seating area to enjoy views of the Mediterranean. Leading off this central room you will find the stylish kitchen is fully equipped with a 5 ring electric, ceramic hob (stove tops), electric oven, fridge freezer, microwave, dishwasher, washing machine, juicer, coffee machine, etc. Also on this level is the master bedroom with a king size bed and an ensuite bathroom which has a bath with a shower over, wc and basin. 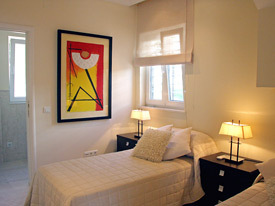 This bedroom benefits from direct access to a terrace overlooking the swimming pool & views of the Mediterranean. The twin bedroom is also located on this level. 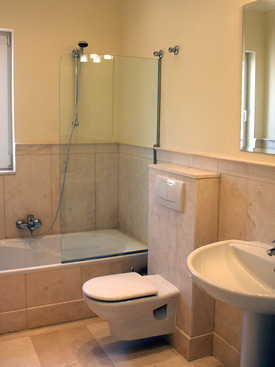 This room has an ensuite walk-in shower, wc and basin. Up a flight of stairs is a family suite with two bedrooms and a bathroom with a walk-in shower, corner spa bath, wc and basin. 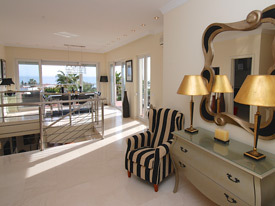 The first bedroom has a king size bed and access to a private balcony with wonderful sea views. The second bedroom has a single bed, this room is more suitable for a child. Please note this room does not have air conditioning and a fan is provided. Down a flight of stairs you will find the lounge with fantastic glass windows along the full length of the room making this a lovely light room looking out onto the garden and swimming pool. In the lounge is a flat screen TV with a DVD player (bring your own dvd-s). There are also two drinks fridges in this room for chilling all your refreshments. The lounge opens out onto another terrace overlooking the pool and garden. The shaded outdoor dining area has a gas bbq for al fresco meals on those sunfilled days and balmy evenings. 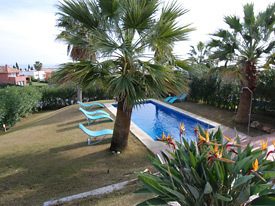 Around the pool are ample sunbeds to relax on and soak up the Spanish sun. There are Roman steps into the pool are perfect for sitting on while reading a book and keeping cool in the sparkling water. 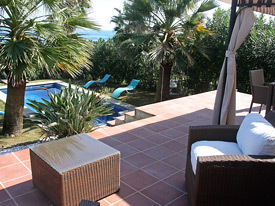 Casa Monaco is just 3km from the El Cristo Beach in the direction of Estepona. The beach is in a delightful sheltered cove which is perfect for children. There are also two beach "chiringitos" that serve mouth-watering snacks and seafood. Estepona marina is also only 3km away, this is a great place to stroll around, admire the boats or sit in one if the many bars and restaurants and watch the world go by. There is a craft market every Sunday morning with all the usual and some unusual and interesting items. It seems the marina has become the weekend meeting place for just about everyone. The 'old town' of Estepona is a lovely place for a wander, with its cobbled streets and white houses it has managed to keep its Spanish feel. There are many street cafes, tapas bars and beautiful squares perfect for and watching the world go by. If cooking is too much like hard work there are many excellent restaurants in the area to try. I love fresh seafood and my favourites are La Escollera in the fishing port (to the right of the main port) and Le Briconnet del Puerto next to the Club Nautico. But, if I fancy a steak it has to be Casa de mi Abuela ... in my opinion it is by far the best Argentinian steak restaurant in Estepona.